I started hearing a lot about Jojo Moyes after her novel, "Me before you" was adapted into a movie. It was after almost a year that I decided to read her novel. As always, I bought in an impulse. I didn't buy "Me before you" though because I thought, why not read her short stories. A couple of days later, a fresh copy of "Paris for one" sat on my lap. I looked at it like observing a cute baby. The pages smelt good and the feeling of feeling a fine copy of paperback triggered my nerves. But one thing surprised me, the book was huge in size; that is to say, long sized. I was expecting a smaller version. Anyway, I started reading the stories. By God, Jojo knows how to write. Jojo, if you read this, let me say, — you're one terrific writer. You know how to conjure so profound dialogues that they start to keep repeating in your head like hearing the rhythm of your favourite music. Your characters are just wow. Half of the time — no almost every time, I half wished the female characters of your stories were real. I will date and marry your characters. 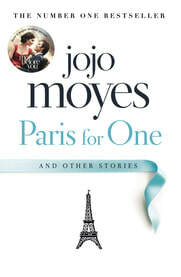 "Paris for One" is a story about Nell who goes to Paris alone when her idiot boyfriend cancels to go along with her but promises to join her later. Nell meets Fabian, a young man who hopes to become a writer one day. This story is the longest and one of the best romance novella I have ever read. God, how I wish I meet a girl who's as exciting as Nell. There are so many other exciting stories. "The Christmas List", "Margot", "Crocodile shoes" have permanently stuck to the back of my brain because the characters are so cool. Her writing style is decorative; with so fewer words, she says so many things. The best part of all her stories was the dialogue. It's the dialogue that kept me turning the pages. If you are about to spend a very cosy weekend, this book is for you. Gift it to your boyfriend or girlfriend or read it yourself — like me — a million times.